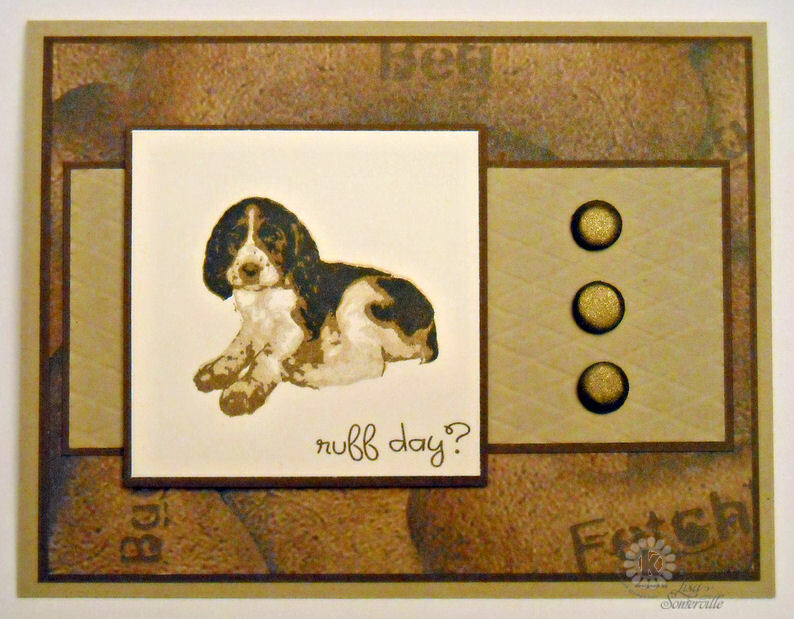 Designs by Lisa Somerville: Bloggers Challenge - Ruff Day and a KSS Memorial Day Sale! Bloggers Challenge - Ruff Day and a KSS Memorial Day Sale! Before I share my challenge card, I wanted to let you know that Kitchen Sink Stamps is having a Memorial Day Moving Sale! Click here (discount will automatically be applied to your cart when you click my link) to save 25% on all product in stock , you'll also receive FREE SHIPPING with a $50 order! HURRY! Sale runs Friday May 27th - Monday May 30th (midnight PST). If your new to Kitchen Sink Stamps, you can browse my KSS YouTube Videos to better understand how to use them. I rummaged through my stamps looking for a "pet" image and also something to go along with this weeks Kraft Journal Challenge - CAS. YIKES! CAS is surely not my thing, but I've been enjoying the Kraft Journal Challenge and gave it a whirl! It took everything I had not to add some sponging or distressed edges to my card! The image and sentiment are both from Kitchen Sink Stamps Multi Step Kittens and Pup set. If you enlarge the card, you'll see I used my Scor-Pal to add some diagonal embossed lines to the Kraft panel. The Scor-Pal makes it so easy to do this, so I figured I could still squeeze it in under CAS. ETA - a project that SHIMMERS.....More Kitchen Sink Stamps, this time they do follow the challenge to MAKE IT SHIMMER! The Big and Bold Swashes are done using the Pearl Ex Gloss Technique, I also used the them to help tie the wonderful 3 Step Bells. The sentiment is from Words of Comfort and Joy. t link to cards that were created prior to the challenge date. Entries not linking properly will be removed. Thanks for stopping by, enjoy your holiday weekend! Adorable! This cute pup is just waiting for some luv. So cute, I love how you colored in this pup and thanks for the enabler alert on the sale! Luv both your cards. The puppy is so adorable. The pearl ex gloss technique works perfect on that card. We get a two-fer today! You are so funny!!! I love the puppy one as that's really how I've been feeling lately. Hoping the long weekend provides a pick me up. 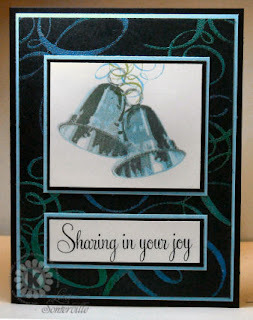 The wedding bells card definitely is perfect with the shimmer! Love these both, Lisa! You know the doggie one really catches my eye! So cute! Have a wonderful Memorial Weekend. Oh, Blogger now has another problem with the follower gadget! A ton of people have written in about that one! So between comments and followers, Blogger has a little work cut out for them! Gorgeous artwork, Lisa! Beautifully created. I love the puppies too...aren't the buttons shimmery they look it. The dog stamp is just so sweet- love the CAS too. Love the Wedding bells- the technique lends itself beautifully and looks elegant. That dog image is too cute! Lovely design and the scoring details are fab! The shimmery card is so pretty with the bells and the swirls! Both cards are beautiful ...but the card with the puppy... how totally adorable is that??!! I love it! Thanks so much for playing along with us for our CAS challenge at The Kraft Journal! Awesome cards, Lisa!! 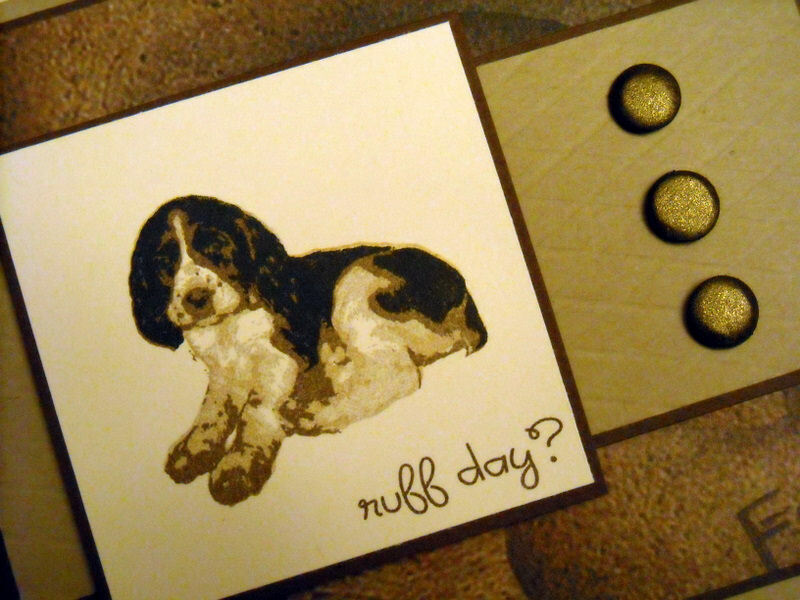 I totally adore your puppy card for the Kraft Outlet challenge. I agree with you about CAS designs being a challenge, but I think you absolutely rocked this one. Love, love the dog and your score-pal work is fabulous. Lisa--these are both great cards--the brads on your woofer card do shimmer nicely--and the bells on the 2nd one are wonderful! Awww...that puppy is too cute. How funny that you "jumped the gun" on the challenge (sounds like something I could easily do). Loved your pretty Bell card.